HomeCheck out the theremin on Google today! Check out the theremin on Google today! OMG! On Google right now, Clara Rockmore playing the theremin! How totally cool. Check it out! Wanna know more about the theremin? Go to my previous post and read all about it. 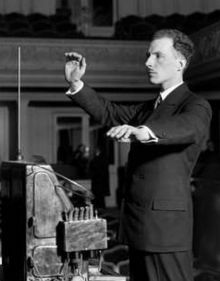 Leon Theremin, inventor of the theremin playing one of the first models that he built.